If you're trying to remove stuck-on dirt and debris from your terrace, patio, fence and garden, then look no further than our list of the best pressure washers of 2018. No more scrubbing away on all-fours; instead, you can simply blast away the dirt in just a few minutes. They’re perfect for removing dirt, grease and oil in an efficient way that requires minimal manual effort. The Shark SGP-353037 Pressure Washer is built for commercial use, with a large, heavy-duty and cumbersome frame. Though this makes life more difficult for use in smaller tasks, it excels in work environments, where its likely to be more exposed to the elements, knocks, bumps and scrapes. This machine features a high-limit hot water control switch, which likely contributes toward getting the washer its ETL certification. This control automatically turns off the burner in the event that the water temperature exceeds safe operating limits. Also, the 11 Horsepower engine is provided by Honda, a brand leader in the design of long-lasting parts. The pressure washer doesn’t just support icy water, which is already very effective at cleaning, but also heats water using a built-in heater, meaning even the toughest stains won’t stand a chance. There’s also a lot to like about the design, which uses only heavy-duty components and materials to guarantee that the machine will stand up to the abuse that commercial environments can throw at it. What’s more, though the length of the warranty varies from part to part, the coil is covered for 3 years, and the pump for a massive 7 years. Though this unit is ideal for commercial purposes, it is less so for home use. Typical uses for a pressure washer in the home include cleaning the patio, walkways, fencing, or cleaning cars and trucks. However, the weight of this product makes it difficult to carry around, so using it for any of these purposes would not be so easy. As a result, it’s a better choice for business use, though as a negative, this is only a minor niggle for us. The Pressure Pro E4040HC Professional Pressure Washer is a machine that could function well in both a commercial or consumer-based environment. With 4,000 PSI and 4.0 GPM, the CU rating is very high for such a small machine, providing excellent cleaning power on a model that is cheaper and more lightweight than some of its equally powerful competitors. The Pressure Pro features a 13 Horsepower Honda engine, known for their quality, long-lasting engines. This design is supplemented by features such as a thermo-sensor that prevents overheating, steel reinforced hosing, and a range of quick-connect nozzles. What's more, it is CARB compliant, for those of you who are environmentally conscious of your carbon footprint. For such a small and lightweight washer, the Pressure Pro outputs a CU rating that can compete with bigger, burlier models such as the Shark SGP-353037 mentioned above. The engine is also very efficient, running smoothly and quietly, despite its high Horsepower. Finally, some clear thought by the manufacturer has gone into the design of the hosing, which at 50 feet is more than adequate for larger tasks, whilst also being reinforced with steel that won’t mark surfaces when dragging. Starting with the practicality of the machine’s design, although it is reasonably lightweight at 99 pounds, it does not have 4 wheels. The inclusion of just 2 heavy-duty wheels means that when this washer is being moved around, most of the load will be transferred into the handles and thus the carrier. This is more of a personal health risk than a machine supported by 4 wheels. Additionally, whereas some pressure washers feature frames that extend around the full body of the Honda engine, this washer has a very minimalistic frame. If care is not taken when maneuvering the machine, then excessive knocks and scrapes could theoretically damage the engine more easily. It is these two issues which unfortunately stops this machine from achieving a perfect rating. This is a powerful, gas-fueled pressure washer from Generac, a brand that enjoys generally very positive customer feedback on their pressure washing systems. This machine is amongst the highest CPU washers on this list, owing to the high GPM and PSI ratings. This machine features a range of components that make it a stand-out pressure washer. One such feature is a low-oil shutdown sensor, which safeguards the engine should the oil reserves drop too low. Another feature is the inclusion of large pneumatic tires, which are perfect for maneuvering the machine when washing larger surface areas, and for absorbing shocks and bumps. With a CU rating of 16,800, the Generac 6565 has the most efficient cleaning of any of the machines we’ve looked at. It also supports heated water, meaning that you can combine high pressure and steam to achieve a perfect clean. At full capacity, the fuel tank can provide up to 2-hours’ worth of continuous use, which should be more than enough for a single session in any non-commercial scenario. Given this machine’s high GPM and PSI ratings, it is inevitable that it also has more recoil than many other pressure washers. As a result, some people report problems with the level of strength needed to use the washer; the elderly, for example, may struggle more. The machine is also very loud when operational, to the point where earmuffs are recommended to prevent any hearing loss. The only other notably negative point worth mentioning is that the startup mechanism can be difficult to use, requiring 2 simultaneous actions of holding one handle, while pulling on the starter cord. For a large machine, this will again likely prove more difficult for some people than others. Noisy when in operation, so earmuffs are highly recommended. The Simpson Cleaning MSH3125-S Pressure Washer is a lightweight, gas-powered washer designed primarily for smaller tasks. Though lightweight, the unit still manages to pack in a powerful Honda engine that provides 3,100 PSI of pressure. Several other small extras within this washer's design provide additional value for money on a machine that is already reasonably priced for a gas-powered pressure washer. Such features include a safety lockout, which prevents spraying of water unintentionally, and a range of nozzles, designed at various angles of operation, which are suited to different purposes. Though the CU rating isn’t the best we’ve seen, that’s to be expected from a smaller, non-commercial pressure washer. For non-commercial purposes, this pressure washer performs well. At just shy of 70 pounds, it is the second lightest machine of the pressure washers we’ve examined, though whereas lighter models normally use an electric power supply, this one does not. Powered by gas, it still manages to squeeze a Honda engine into the lightweight design. The engine is also straight-forward to operate, with a single pull cord mechanism, saving one hand for the pump hose. Though it's something that the manufacturer appears to have since fixed, older designs of this pressure washer were plagued with issues relating to the nozzle holder. This would cause nozzles to vibrate out of their holster when in operation. That aside, other negatives to point out include a lack of flexibility in the hose, which can make coiling and storing the hose rather difficult, as well as a cut-off that prevents operation if the air filter takes on oil. This happens more easily than you might expect. The absence of any gas or gasoline-powered brand-name engine massively reduces the price tag on this Sun Joe Electric Pressure Washer, which is a low-budget consumer washer suited to smaller tasks in and around the home. Though it can’t compete with engine-powered machines of a higher caliber, it’s lightweight and easy to move around. The Sun Joe washer surprises with its functionality, given the inexpensive price tag. Included in the package are 5 quick-connect spray tips and a high-pressure hose, as well as a Total Stop System (TSS) that will automatically shut off the pump when the trigger is not engaged. It’s also CSA-approved with a full 2-year warranty on all components. There are two main benefits to this pressure washer being of an electric design, the first being that it means the unit can come fully-assembled, save for just 2 screws. The second benefit is that the washer runs very quietly, removing the need for earmuffs, whilst simultaneously giving off no fumes. The fact that the machine is also fully covered under a 2-year warranty is another benefit, given that many washers split out the engine, parts and components into limited warranties of varying lengths. What’s more, the warranty can be extended for a reasonable price. Although the Sun Joe includes a hose reel that makes for easy storage, it doesn’t do so well with the power cord; a single hook helps to wind up the cord after use, but there’s a lack of a second hook to hold the cabling in place. This pressure washer is also only suited to cold water, whereas others we’ve reviewed are capable of washing with heated water for additional cleaning power. No second hook for hanging the coiled power cord. On a basic level, all pressure washers work in the same way. Water is fed into the machine at a low pressure, from an outdoor hose or nozzle for example, before being pumped through a hose and sprayer nozzle at a much higher pressure. It is this increased pressure that makes these machines so adept at sweeping away stains, dirt and debris. Beyond this base functionality, there are differences from one pressure washer to another that can impact on factors such as the machine’s price tag and cleaning power. Below, we’ll look at the most important features to be aware of when buying a new pressure washer. Pressure washers can be picked up as gas-powered, gasoline-powered, or electric powered machines. The former 2 types use engines, often provided by Honda, whereas the latter type uses AC power. Electric washers are typically cheaper to run and far quieter, making them more appropriate for consumer use in and around the home; however, they are also less powerful than pressure washers that use an engine. Though PSI, GPM and wattage are all important to take into consideration, you can judge the efficiency of a pressure washer by its Cleaning Units, or CU. To calculate a washer’s CU, you simply multiply the Gallons Per Minute (GPM) with the Pounds per Square Inch (PSI). The larger the number, the more quickly the machine can clean a surface. 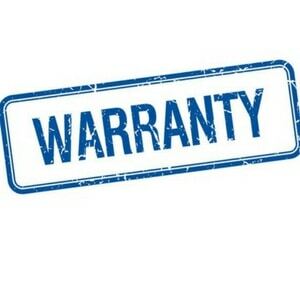 Warranties can come in full or limited forms. Limited warranties usually only cover some of the components rather than all of them, or may cover all parts, but under varying lengths. Typically, consumable parts like nozzles will have shorter warranty lifespans. On the other hand, full warranties usually cover all parts equally. 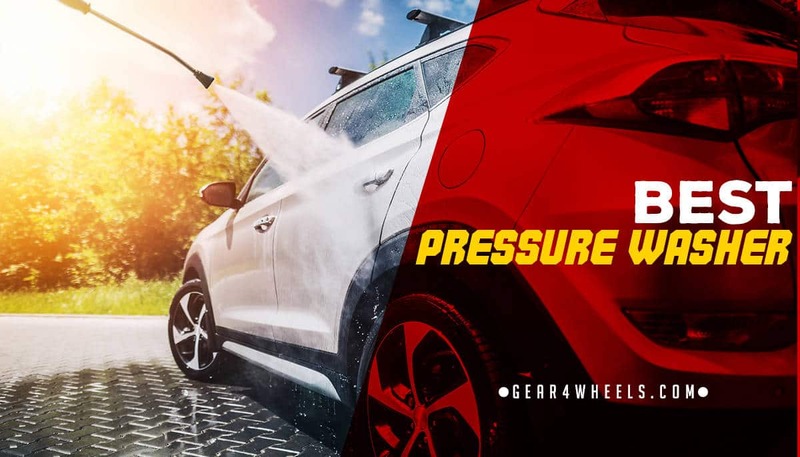 For practicality, you should take into consideration the design of the pressure washer chassis, particularly for engine-powered washers, and the machine's overall weight. A chassis that fully encloses and protects the engine is best, to prevent damage to internal components. However, this should be balanced with the weight of the washer, depending upon its intended use. For non-commercial purposes, such as occasionally cleaning cars and walkways, you’d be best to choose a pressure washer on the lighter end of the scale. Can a pressure washer damage wood? Some pressure washers can damage wood, so it's important to use one that's appropriate for the surface. Select a machine that is 3,000 PSI at most, and ensure that you're using a nozzle with a wide spray; more focused nozzles can cause damage. Finally, maintain a reasonable distance from the surface being cleaned; between 1 to 2 feet should suffice. Is a pressure washer safe for your car? Some people worry that pressure washers will drive dirt into car paintwork, causing scratches. However, the water gets beneath the dirt particles, protecting the paintwork from damage. This can be eased further by applying a pre-wash prior to using the pressure washer. You should avoid prolonged, close-contact use on tire sidewalls, though. Will a pressure washer remove wax? If held too closely, or a narrow tip used, then your pressure washer could remove your car’s wax. Some is bound to be stripped away during each wash, though this effect can be minimized by using a weaker machine, around 1,500 PSI, and by avoiding harsh chemicals when washing. Will a pressure washer remove rust from metal? Unlike protecting wooden surfaces or paintwork on vehicles, removing rust takes a high-pressure washer. Furthermore, a narrower nozzle is more appropriate, providing a targeted, powerful spray to erode the rust particles. A better result may be possible using a commercial rust removal cleaner. What pressure washer for oil? Providing that the spillage hasn't had time sit, a medium to strong pressure washer is sufficient to remove smaller stains. Cleaner should be applied to the spillage first, before it's sprayed with a detergent. It may take a good 5-10 minutes' worth of cleaning to achieve a complete clean. Based on all of the above information, and our close examination of the best pressure washers on the market, our pick of the best is the Shark SGP-353037. The design offers a great deal of protection to the internal components of the machine, while the warranty on most components is generous enough to offer protection against any early failures. The ETL certification is also a clear marker of a safe machine. The negatives, including a large frame and cumbersome weight, aren’t sufficient enough to affect our recommendation, and as a result we give this product our best rating.